Opinion: Could the U.S. be Considered an 'Islamic' Country? You are here: Home » Regional news » Middle East & Africa » Opinion: Could the U.S. be Considered an ‘Islamic’ Country? What do we mean – if anything – when we ask what does an ‘Islamic’ country look like? This is the question that I puzzled over as I sat in a traditional dhow at sunset, sailing down the creek that lies at the heart of old Dubai. On one side was the historic area of Bastakiyya, where little houses and minarets populated the water’s edge. As darkness fell, the adhan began to echo from both sides of the creek. I felt at peace; the call to prayer in stereo around me and the beauty of the reddening sun reflected on the water. The UAE is at its core an Arabic nation with Arabic language and the traditional domed mosques with minarets that we think of as typical for an Islamic country. Next door to Saudi Arabia, it lies barely 12 hours by road to Makkah and Madinah. Despite a large expatriate population, which means that many people who live in the Emirates are not actually Muslim, practicalities like halal meat, the observance of Ramadan and national holidays in line with Islamic events are the norm. But does all of this make it Islamic? What about Indonesia? Eighty-eight percent of its 237m population is Muslim – which means in absolute terms there are more Indonesian Muslims than all of the Arab Muslims in the world put together. Unlike most of its Arab counterparts, Indonesia’s constitution is democratically based, and in principle at least allows for minorities to have their rights protected and participate fully in the nation’s civic and political life. Yet Indonesians don’t speak Arabic, don’t wear abayas and are comparatively liberal when it comes to women participating in the public domain. And what of India? According to the Pew Research Centre, Muslims make up over 13% of the Indian population and 10% of the world’s overall Muslim population. Couple that with India’s vast and powerful Mughal heritage and you have to wonder: if numbers and heritage are important, then surely India is an Islamic country? Then we have Turkey – home of the Ottoman empire, and once again held in positive esteem by Muslims as its leaders speak up about Gaza, defend women’s rights to veil and whose government is led by the AK Party – AK being the acronym for Justice and Development – but which has been dubbed an ‘Islamist’ party. Is this the list of Islamic countries? Or does ‘Islamic’ or ‘Muslim’ mean something else? But if we’re looking at size and history as markers of being Islamic, then there is a whole list that qualifies. A few surprising examples might include: China (21 million, early to mid 7th century); Kazakhstan (almost 9m, in the 8th century), and even the USA (6.4m and possibly as early as the 10th century via Spain). Clearly, population size, history, Arabic ethnicity and language, or sub-continental origins and even proximity to the Holy Cities go a long way towards shaping our ideas of a country that we consider ‘Islamic.’ But do these criteria still stand when countries that we might consider ‘un-Islamic’ appear to offer more freedom to practice Islam, and that also expound what appear to be Islamic principles. Consider examples such as the welfare state to take care of the poor, or laws to prosecute racial or sexual discrimination. So, the answer to our question is not so clear-cut – the idea of a checklist of qualities by which we can identify an ‘Islamic’ country doesn’t appear to hold water in the modern world. And this realisation has profound implications for the oft-repeated phrases of Dar al Islam and Dar al Kufr which are still used to shape Muslim thinking about world affairs. Those phrases relate to a time when religious identity was closely tied to citizenship. But even then, the Muslim empires had populations that were not Muslim but who held significant sway. This means we need to think more carefully about glib categorisations of countries and populations as ‘Islamic’ or ‘un-Islamic.’ Today’s world is not so black and white. 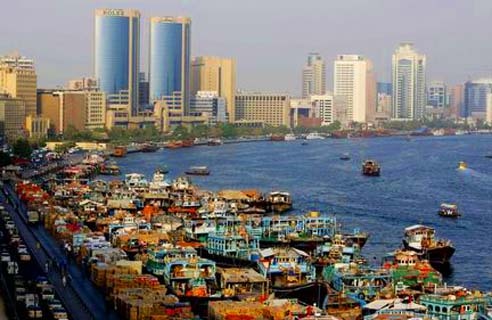 As for my boat ride along the Dubai creek – one thing I realised is that whilst we may want be wistful about a traditional past, what lies beneath is the drive towards a modern multicultural reality. As Muslims, rather than hark back to romantic images of what once was, what we need to address is how to implement Islamic values for the future. This article was first published in Emel magazine.